Medicine is a complex social institution which includes biomedical research, clinical practice, and the administration and organization of health care delivery. As such, it is amenable to analysis from a number of disciplines and directions. The present volume is composed of revised papers on the theme of "Responsibility in Health Care" presented at the Eleventh Trans- Disciplinary Symposium on Philosophy and Medicine, which was held in Springfield, illinois on March 16-18, 1981. The collective focus of these essays is the clinical practice of medicine and the themes and issues related to questions of responsibility in that setting. 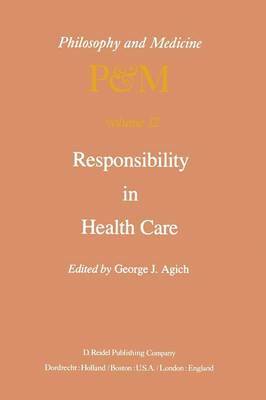 Responsibility has three related dimensions which make it a suitable theme for an inquiry into clinical medicine: (a) an external dimension in legal and political analysis in which the State imposes penalties on individuals and groups and in which officials and governments are held accountable for policies; (b) an internal dimension in moral and ethical analysis in which individuals take into account the consequences of their actions and the criteria which bear upon their choices; and © a comprehensive dimension in social and cultural analysis in which values are ordered in the structure of a civilization (, p. 5). The title "Responsibility in Health Care" thus signifies a broad inquiry not only into the ethics of individual character and actions, but the moral foundations of the cultural, legal, political, and social context of health care generally.